Gastronomy 101: Pimp My Rice - What if no one's watching? THE THING WITH FILIPINO CUISINE served elsewhere is that I am bound to be harsh to it no matter what. That’s just inevitable. My mother is an excellent cook – most Filipino mothers are – and it sets a standard so high that I am meant to almost always compare it to her cooking. Now being married, I have another mother who is a great cook as well, so pleasing me will be twice as difficult. I also have a thing about presentation too. So far all Filipino restaurants that I know around Winnipeg are karinderya-style with less thought put on the restaurant’s interior. You get a good amount of serving of food though, which I am guessing what is being prioritized. 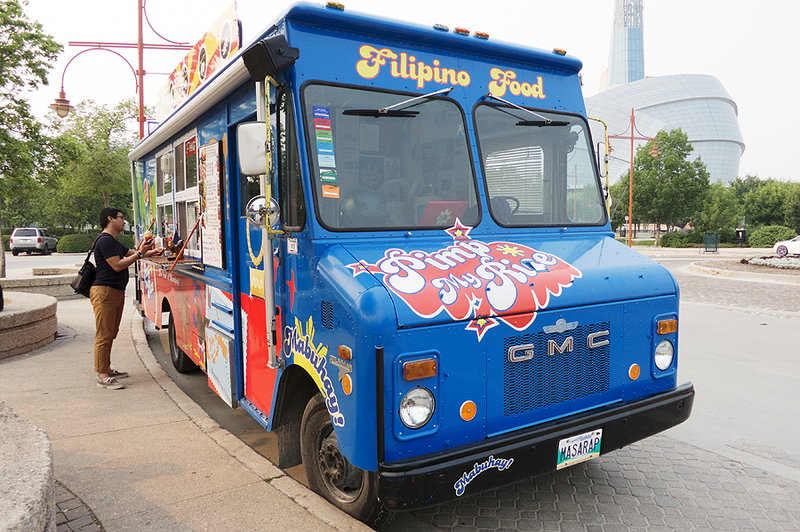 These are the reasons why I am reluctant to try Pimp My Rice – one of the many successful food trucks that operate across the city. 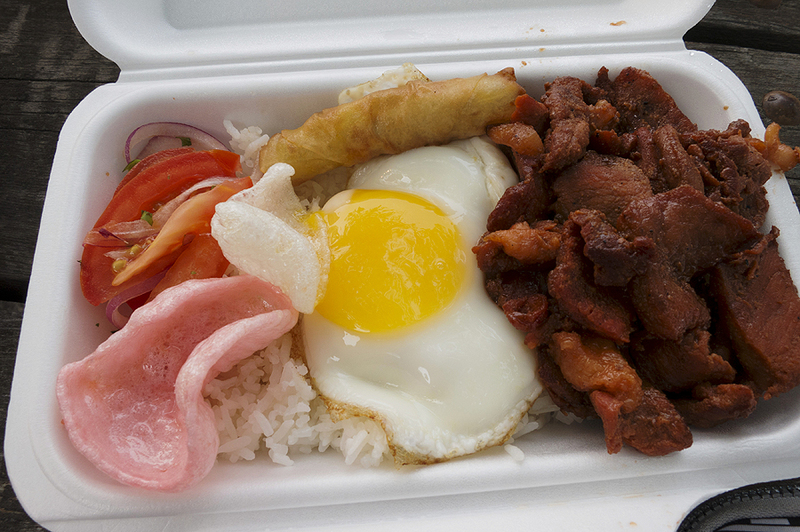 My mentality was that if I am going go eat Filipino food, then I’d rather stay home. 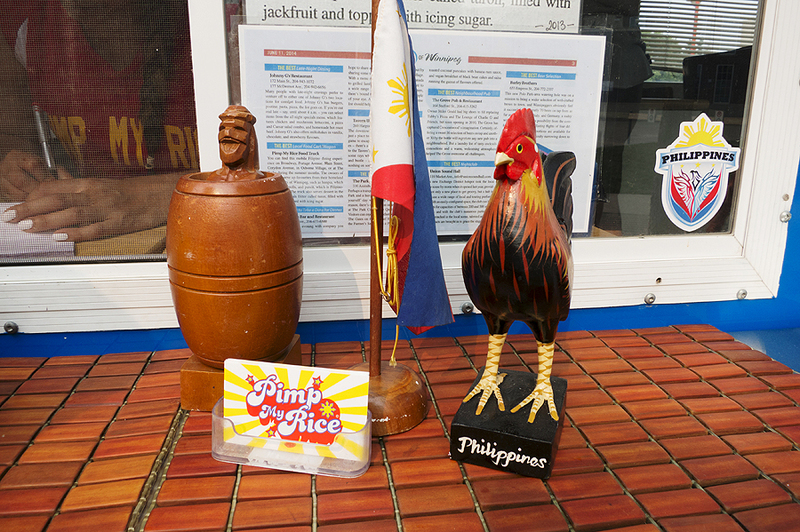 I think their main clientele are people who wanted to try (or not familiar with) Filipino food. 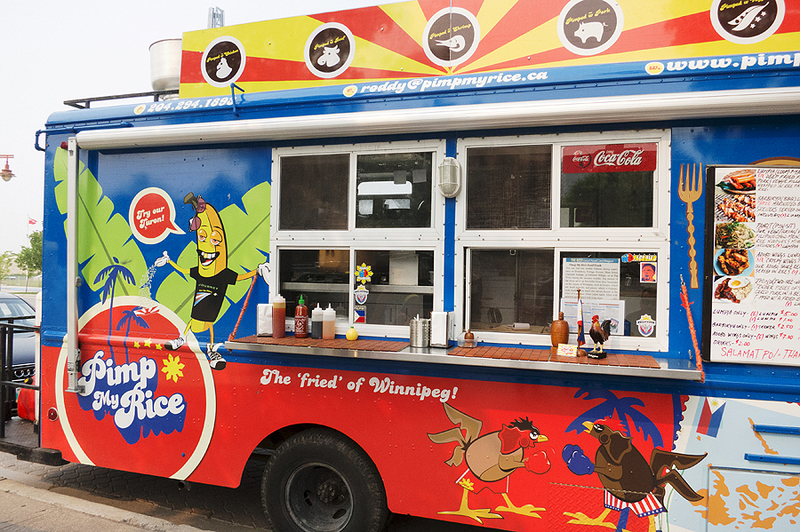 But we were outside for the day and there were only two trucks at The Forks that time, and I was craving for meat. So what the heck, let me try it. The truck, oh gosh, the truck. It was as gaudy and entertaining as what I thought it would be. Like it reminds me of all Filipino people’s Tito Boy who worked in Saudi, or those who wear the red, white, and blue sports jacket, reminiscent of the country’s flag. One teenager got a surprise of his life when he figured out what the wooden figure displayed near the counter is all about (I had a laugh about it, sorry kid!). My husband ordered the Tocino (sweet cured pork) set while I had the Adobo wings set. 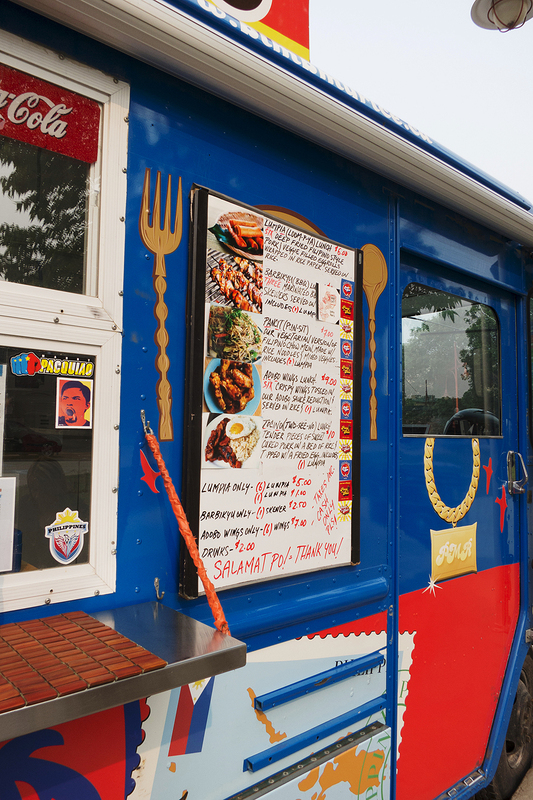 The wings have been making noise for a few years now, as one of the popular picks during Many Fest‘ Food Truck Wars. For me it did not disappoint. 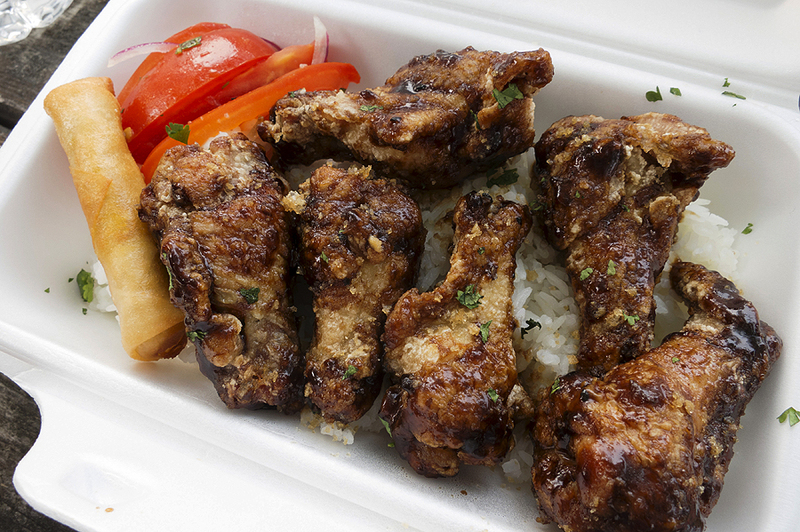 I am truly in love with Filipino-style Adobo, and its many formats (trust me, there’s so many ways to cook it), so having a chicken wings style with a drizzle of adobo reduction is refreshing to me. 6 pieces of serving may look really small but for some reason the whole set was quite filling. I didn’t like the Lumpiang Shanghai that much; I have yet to taste something that will be up to par (or beat) my mom’s recipe. ANYWAY, this blog is about photos, so here they are.